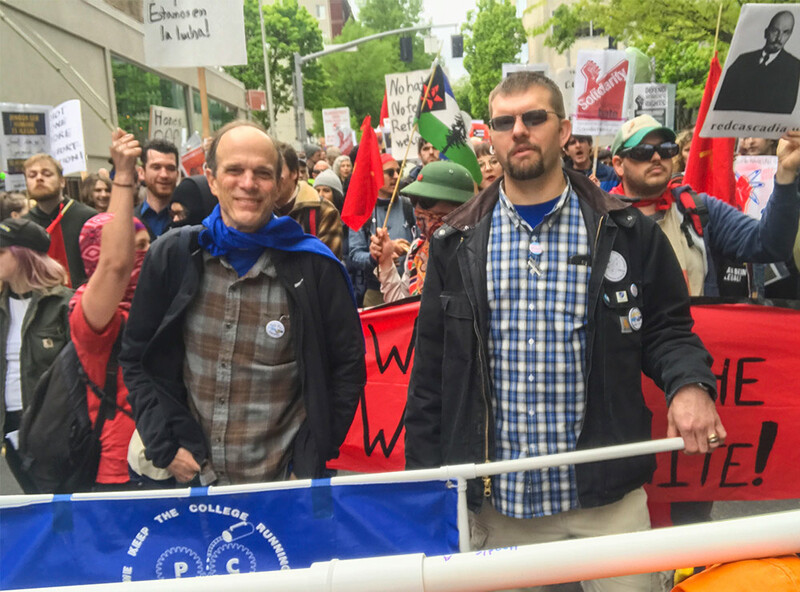 Peter Seaman, AP rep on the bargaining team, guest-writes this bargaining update. The administration team presented cost estimates. Federation members turned out in force to support the bargaining team! Increase the number of steps for PT faculty from 9 to 17, to match FT faculty. At the June 13th bargaining session, the administration team presented their estimate of the cost of each of these proposals, along with cost estimates for a few other proposals we had put forward (health-care cap, PT health-care fund, and classified early retirement). The admin estimates seemed high, but after some questioning they offered to share all of their spreadsheets so we can examine the formulas and data. The administration team also shared (actually re-shared) their picture of the 2017-19 budget. What they seem to be telling us is that there is no money to fund the proposals we have put forward, but we continue to believe that the money can be found. For example, the budget shows $1.5 million for the district president’s priorities (as yet undefined) and $2 million to maintain college buildings – *above* what has been spent in the past. We believe that your pay and benefits are at least as important as the priorities that are being put forth – especially in the booming Portland economy, where the cost of living continues to skyrocket. The most wonderful thing about bargaining on June 13th – and that word “wonderful” doesn’t often appear in the same sentence as “bargaining” – was seeing over 30 FFAP and FCE members who turned out and sat behind our team during bargaining! I know it made an impression on the admin team, who couldn’t help but noticing our strength and our resolve. I can’t tell you how much stronger I felt during bargaining, just knowing that so many colleagues were literally backing me up. Let’s continue to turn out and put pressure on the administration for a fair settlement! Sign up to attend the next bargaining session! A 4% Cost of Living Allowance (COLA) for all employee classes (FT Faculty, PT Faculty, AP and Classified) in each of the next two years (2017-18 and 2018-19) This would help members who are struggling with the skyrocketing cost of housing in our district, among other things. Add a new top step for all employee classes, and delete the bottom step. Approximately 25% of our members are at the top step and are no longer eligible for annual step increases. A new top step would reward these members for their many years of service. Increase the number of steps for PT Faculty from nine to 17. This would increase parity for PT faculty who perform the same instructional work but are paid far less than their FT faculty counterparts. Our proposal would increase the number of hours between steps (from 400 to 500) but it would also make it possible for PT faculty who have accumulated at least 8000 contact hours at the proposed top step 17, to earn $1,500 per lecture hour. The current pay scale tops out at $970 per lecture hour..
No COLA for any employee class; instead a 1% salary reduction. The normal annual step increases for those on steps. Individuals at the top step, who do not move a step anymore, would therefore receive a 1% pay reduction. Obviously, the two sides are far apart! This is why it’s more important than ever for YOU – our members – to get active! Button up! Attend an open bargaining session! Spread the word to your colleagues! We need you to show solidarity with the bargaining team who is on the front line fighting against these unreasonable salary reductions. Lastly, I’d like to thank the members who came to observe the bargaining session last Friday. We appreciated your thoughtful input and your presence sends a strong message to administration that we demand nothing less than a fair and reasonable contract. As PCC faces challenges to balance its 2017-19 budget, you should know that your Federation bargaining team is fighting on your behalf to preserve – and improve – your existing workplace pay, benefits, and conditions. It’s worth noting that without a strong union, PCC administrators could impose budget restrictions however they chose. As I said in my last message, we believe there are budgetary funds for a fair and reasonable settlement on pay and benefits. Please keep this position in mind if you choose to attend a budget forum. You can sign up here to attend. I hope to see some of you there. Show your Support during Bargaining! I am writing with a reminder that this Friday, at 9am, the Federation invites members to attend an open bargaining session at CLIMB. Our agenda includes issues pertinent to both FT and PT faculty, although APs are always welcome to observe as well. Please click here to sign up. If you are not able to make it to the bargaining session, you can still show your support by buttoning up! Displaying supportive messages on your clothing, bag, or in your workspace will let the administration know that we will not settle for anything less than a fair and reasonable contract. If you don’t have your buttons yet, stop by the Federation office or reply to this email. Lastly, the PCCFFAP website has undergone a renovation, and we’ll be posting bargaining updates here as well as member testimonials. I encourage you to read PCC Reference Librarian and PCCFFAP Executive Council member Sara Robertson’s moving account about how union benefits protected her during a health crisis. It’s a good reminder to be grateful for the rights we have won, and to remain vigilant in the face of threats to our livelihoods. Thank you for all you do. I hope to see you at a bargaining session. Author WebmasterPosted on May 10, 2017 Categories Adjunct Faculty, Bargaining, Full Time Faculty, President's Messages, Take Action! I’m writing to invite you to join your fellow workers at the May Day demonstration on Monday, May 1st. The demonstration will take place in Shemanski Park (north end of the PSU Park blocks), with a rally at 2PM and a march to follow at 3PM. PCCFFAP leaders and members will be under the marquee on the 8th Ave. side of the Schnitz–right across the street from Shemanski Park starting at 2:30 and will join the march when it starts at 3pm. We’ll have PCCFFAP banners, shirts, and more for you to wear. Why do this? As you may know, May Day is also known as International Workers’ Day, and is the traditional workers holiday throughout the world. The day was chosen to commemorate the Haymarket Affair, widely seen as the start of the Labor Movement in the United States–when over 200,000 workers in Chicago struck for the 8-hour work day. Many countries continue to celebrate their workers and labor movements on the first of May, but not the United States. Please join us in celebrating labor history, and also to advocate for labor, environmental and racial justice in the United States and throughout the world. We aim not just to resist, but advocate for a better world. It starts with getting involved wherever possible. Let us know if you can be part of the meet up–or just show up with friends, family, and/or co-workers. I hope to see you there. Author WebmasterPosted on April 26, 2017 May 8, 2017 Categories News, President's Messages, Take Action! Last Friday, your Federation bargaining team, along with PCC administration, kicked off the 2017-19 Contract reopener. I am writing to update you about what was discussed, but first, for those of you who signed up to attend a bargaining session on April 14 or April 21, please note that those dates have been cancelled due to scheduling conflicts. Here’s a google doc with newly agreed upon dates and times. Please, spread the word! Sign up to attend a session! Our presence at these meetings will ensure that the administration knows we are united in our pursuit of a fair and reasonable contract. 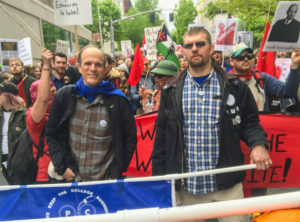 Last Friday’s opening bargaining session had only two items on the agenda: 1) Establishment of the ground rules, a document that both sides agree to prior to the substantive wage and benefits discussion, and 2) An update on the PCC Budget presented by Vice President of Finance Jim Langstraat. It was a good discussion and we expect to come to a resolution on the ground rules prior to the next bargaining meeting on May 3. The cost of living in Portland is increasing at an alarming rate – According to the Bureau of Housing and Urban Development (HUD), housing costs in Portland increased by 21% in the last year alone. Nationwide, 25% of part-time faculty members at colleges and universities are on some form of public assistance. Anecdotal data from our members reflects this. The State of Oregon is expected to fund community colleges at the same or slightly higher levels as the prior biennium (We will know for sure in June). The PCC Board of Directors voted to raise tuition in each of the next two years, resulting in an additional $16 million in revenue for PCC. A PCC Bond Measure is planned for 2017. If passed, this would fund deferred maintenance and building upgrades across the district. The administration wants to add $2 million to the college’s reserve fund (basically a “rainy day fund”), which currently stands at $20 million. The administration wants to increase the amount of funding for administrator salary and benefits by 10% for the biennium (through a combination of salary increases for current administrators and new administrative positions). An across the board Cost of Living Allowance (COLA) for everyone in our union is a high priority for our members. For context, a 1% COLA for all faculty, AP, and classified employees would cost the college $3.3 million over two years. By some estimates, we would need an 8.1% COLA to keep up with the cost of living in Portland! Part time faculty teach 72% of classes at PCC, but they have only nine steps in their pay scale compared to 17 for full time faculty, APs, and classified, so it takes much longer for them to advance. They deserve an equitable advancement path that is consistent with their full time and AP colleagues. If you agree with the Federation’s priorities and you want to support the efforts of the bargaining team, please click here! I hope to see you at a Contract Action Team (CAT) meeting or bargaining session in the near future. I’m pleased to announce that the federation will be participating in AFT-Oregon’s second annual Member Organizer Development Program (MOD-P), a training and development opportunity for PCCFFAP members (that’s you!) who are ready to take their organizing skills to the next level and build our union for the future. MOD-P is a 6-week program that teaches organizing skills through real-world experience in concert with staff and local leaders. Members who participate are supported through a work stipend that reimburses them for lost wages, and help securing release time from our employer. Admittance into the program is competitive and will be based on an application and interview. Thinking of applying? Want to talk more about it? Send me an email now and I can help you apply before April 17. Author WebmasterPosted on April 10, 2017 April 13, 2017 Categories News, President's Messages, Take Action! 2017 Contract Reopener: You’re Invited! Have you ever wondered what happens when your Federation bargaining team sits down with PCC administration to negotiate pay and benefits? Now is your chance to find out! This year, bargaining sessions will be open to any member who wishes to attend. Click here for dates and times, and to sign up to be an observer. You’ll also find information about joining the Contract Action Team (CAT), a committee of union members who are interested in learning more about bargaining and supporting the bargaining team. We’ll post agendas for bargaining meetings on this form as they become available – typically one week in advance. As I’ve shared before, this year is a contract reopener, which means that only wages and benefits will be negotiated. Working conditions, including the three-year contracts for PT faculty, will be on the agenda in 2019 when we have full contract negotiations. The PCC Board of Directors approval of a $14 tuition increase over two years. 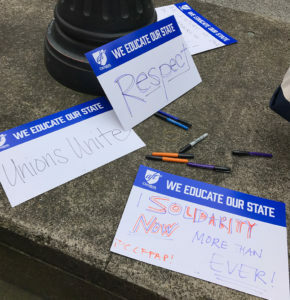 Assuming state funding remains stable, we are confident that your bargaining team will be able to negotiate a fair and reasonable contract that includes COLAs, pay equity for part-time Faculty, and other issues that are important to our members’ lives and livelihoods. Stay tuned for more updates, and I hope to see some of you at negotiation sessions!